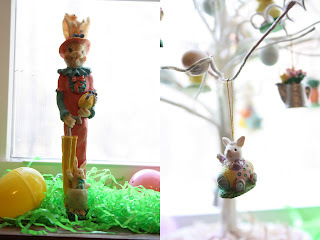 Whispers from Wildwood: It's beginning to look alot like Easter! It's beginning to look alot like Easter! This is the centerpiece I made for the breakfast room table. I used a clear cake plate for the base to hold the green Easter grass. Years ago, I ordered this little fiber optic tree and bunny from ABC Distributing. I plopped him down in the grass and surrounded him with plastic Easter eggs......simple, but so cute :) In the background, you can see my pie safe. It's full of Easter items as well. and what can be more "springy" than a bowl of lemons? This is the window above my kitchen sink. I love this piece of furniture in my foyer! I use it to display seasonal items as well. 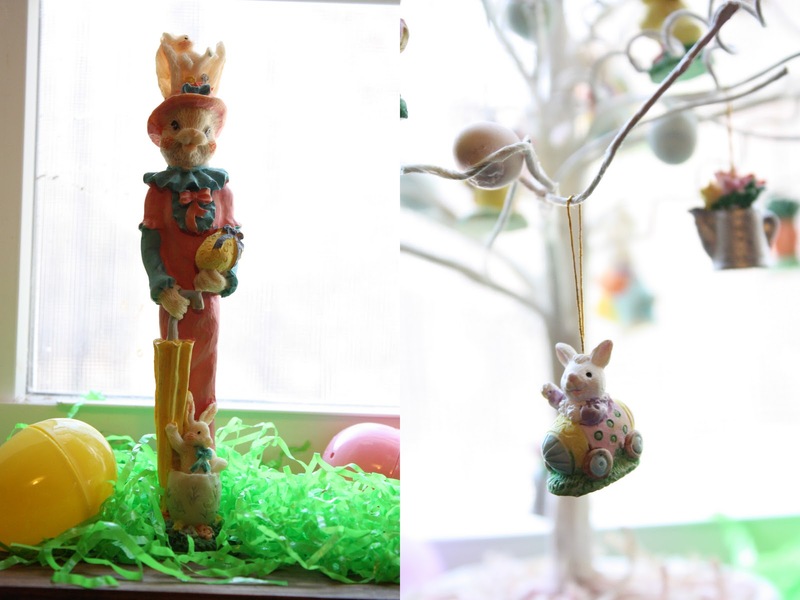 Here you will see a nest of tulips, decorative Easter cake pedestal, and more bunnies and egg cups. There's a special item on the top shelf, but I'll talk more about that in a moment. I found these two bunnies at the Dollar Tree the other day....so cute, aren't they? They even had bags of the fake moss that you see displayed in high end designs today. I came across this Peter Rabbit ceramic pot at a yard sale years ago. The tip of the spout is chipped off, but I just had to have it. With flowers in it, it's really not too noticeable. More Dollar Store finds....except for the egg... it was a gift. I saved this for last, not because I don't know the REAL meaning of Easter, but because I wanted to emphasize it. I love all the fun things with the bunnies and eggs, but what I love more is Jesus Christ! I see nothing wrong with the Easter Bunny showing up or hunting for eggs because I also see the meaning behind some of these traditions. I believe God wants us to have a good time and laugh and play games. He designed us for that. As a matter of fact, He enjoys laughing with us....or even AT us :) We just need to stop long enough to reflect on Easter and what we are really celebrating. We are celebrating the Risen Lord! Jesus willingly walked up Calvary's Hill, bearing the weight of the cross. He willingly hung on that cross and died for me and for you. He took on the sin of the entire world in order to reconcile us to God. Without this sacrifice, we would never know an eternal life with God. We would never know the joy of new life....a new life in Christ! and Welcome Jesus into your heart! Oh my...how pretty...thanks for sharing with all of us!